West Coast Catholic: Tribute to Ben Breedlove: "Do You Believe in Angels or God?....I Do !" Tribute to Ben Breedlove: "Do You Believe in Angels or God?....I Do !" I saw this video this evening. I gave me a chance to be thankful for all that I have. A precious family and home, everything that I have which God has given me. 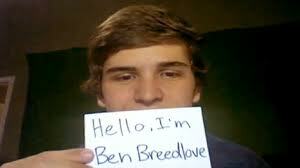 Ben Breedlove's message is a touching one. He put together this two part video to describe his life with a heart condition he lived with until his death on Sunday, Christmas day. It's a story that I can identify with. Ben describes a heart pacemaker operation in 2009 to assist with his condition. I too underwent heart surgery that same year, just days before my birthday. I spent my birthday in the hospital as well as Thanksgiving day. This year my birthday landed on Thanksgiving day. It was the first time I ever had a stay in the hospital...it was all very unexpected, very stressful, and I consider it a blessing. These days before the New Year, lets all take a moment to remember our blessings. Take a look at this video, I'm sure it will inspire you.